On 27 June, the DYNAFREIGHT project will host its Final Conference in Brussels. This event will be the opportunity to present all results achieved during the past 20 months. The DYNAFREIGHT project’s aim was to provide the necessary input for the development of the next railway freight propulsion concepts within the Shift2Rail Innovation Programme 5, and to contribute to overcoming the problems of operational and technical nature that have been affecting the overall capacity, performance and competitiveness of the EU rail freight industry. This final conference is a great opportunity to find out about DYNAFREIGHT ‘s results while exchanging with stakeholders from the whole European rail community! Participation is free of charge and participants are requested to register HERE before the 31st of May 2018. Identifying adaptions needed in the infrastructure for the operation of long freight trains up to 1,500m. DYNAFREIGHT participated in the Shift Freight to Rail event on the 18th of April in Vienna. The Shift Freight to Rail event offered the opportunity to present the preliminary results of DYNAFREIGHT to freight expert coming from all over Europe. Andrea Demadonna (UNIFE), DYNAFREIGHT Project Coordinator, introduced the presentation with a general overview of project objectives and structure. Simon Iwnicki (Huddersfield University) focused on the main available results of WP2 on Freight Locomotive’s Running Gear, while Visakh Krishna (KTH) and Carlo Vaghi (FIT Consulting) illustrated the main achievements on Task 3.2 Safety precautions in train configuration and brake application and Task 3.3 Adaptions in the rail infrastructure for long-train operation respectively. 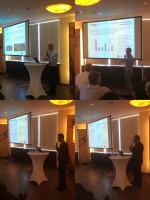 Five other ongoing Shift2Rail freight projects (ARCC, FFL4E, FR8RAIL, SMART and INNOWAG) showed their preliminary outcomes in areas such as long trains, obstacle detection, wagon design, real time management and automated operations. The DYNAFREIGHT Final Conference will take place on the 27th of June in Brussels. More information will follow soon. DYNAFREIGHT is organising an Advisory Group Conference Call on the 8th of May. 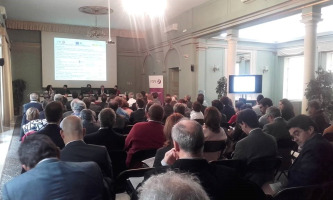 The meeting will be the occasion to present the interim results of the project and discuss with external stakeholders about the impact and potential of its outputs. An analysis of the freight parameters to be monitored and the expected impact in terms of monitoring LCC. As part of the Seminar onRailway Technology, a perspective of the project was given at the Technical Universityof Berlin (TUB). The presentation (Vorstellung des Projektes‘Dynafreight’ - Innovative technische Lösungen für die Verbesserung derZugdynamik und den Betrieb der längeren Güterzüge) was mainly focused on the technicalaims, the methods and the achieved results in the tasks, in which theresearchers of Berlin are involved: the noise reduction, the radial steeringsolutions for locomotive bogies and the safety precautions for long trainoperations. After the presentation, an extensive discussion tookplace. It mainly addressed the real possibility of 1.5 km long trains, whichwould be a serious step for the future freight operation in Europe. Around 40 experts took part in the seminar. Some ofthe companies that were present: DB Netz AG, BVG, VDEI, etc. DYNAFREIGHT WP2 (Next Generation Freight Locomotive's Bogie) will be present at TRA during the poster session. 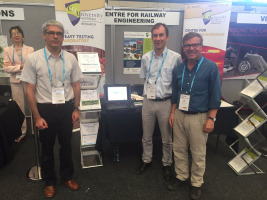 The poster, developed by several DYNAFREIGHT partners (Huddersfield University and Stadler Rail Valencia as main author, POLIMI, LucchiniRS, TUB and UNIFE), has been titled ''Design of a novel, low impact bogie for a freight locomotive''. 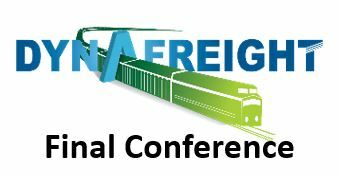 DYNAFREIGHT WP3 (Operation of Long Freight Trains) will be present at TRA during the poster session. 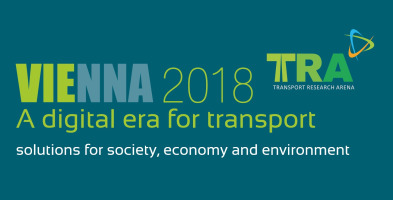 The poster, developed by several DYNAFREIGHT partners (FIT Consulting as lead author, KTH, ADIF, Laird and UNIFE), has been titled ''Scenarios and requirements for the operation of longer freight trains in Europe''. DYNAFREIGHT will be present at TRA2018 with the first newsletter which will be distributed at UNIFE stand. You are welcome to visit UNIFE stand and ask for more information about the project! Moreover, DYNAFREIGHT will participate in the IP5 Joint Event together with all other IP5 CFM and OC Projects to present its main achievements so far. DYNAFREIGHT was disseminated during the Transport Logistic fair which took place between 9 and 12 May in Munich. The event gave visitors a complete look at the entire process chain of the transport and logistics sector. At the trade fair, 2,162 exhibitors from 62 countries showcased their products and services at this industry´s leading international trade fair. Transport logistic Munich also featured an extensive program of related events and conferences. Furthermore the trade fair served as ideal platform for knowledge transfer and networking. 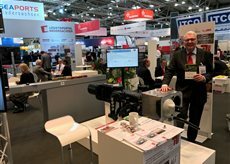 DYNAFREIGHT brochures were displayed and distributed at the Technische Universität Berlin stand and UNIFE was also present on 10 May. DYNAFREIGHT (Innovative technical solutions for improved train DYNAmics and operation of longer FREIGHt Trains) KO meeting was successfully held on the 23rd of November in Brussels. DYNAFREIGHT, coordinated by UNIFE, is a 20-month Shift2Rail project which includes 10 partners from 6 EU Member-states: UNIFE Lucchini RS, KTH, Politecnico di Milano, Technische Universität Berlin, Huddersfield University, ADIF, Laird Controls Europe and FIT Consulting. DYNAFREIGHT will contribute to EU rail freight transport vision by focusing on the next generation freight bogie locomotives and on preparing the path for regular operations of long freight trains (up to 1,500m), providing the first steps for the development of TD5.5 New Freight Propulsion Concepts within Shift2Rail IP5. During the event, partners presented the planned work and a fruitful discussion with members of the corresponding CFM project FFL4E (Future Freight Locomotive for Europe) took place, ensuring the full alignment of the two projects in terms of activities and transfer of results. The DYNAFREIGHT project officially started on 1 November 2016. 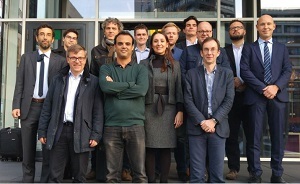 The kick-off meeting was successfully held in Brussels on 23 November 2016, organised by UNIFE.